Before making the final decision that Pastificio Faella was Gustiamo-worthy, after our careful due diligence (read of our visit to Gragnano, here) the pasta needed to pass the final test: we must eat it! La Prova del Cuoco! Sergio Cinque, of Pastificio Faella, drove me on a winding and VERY narrow road uphill (so uphill, at times it looked vertical) 30 minutes past Gragnano. (Glad I am from Napoli and used to these roads and this crazy traffic. I didn’t blink an eye!) We arrived to L’Angolo del Paradiso, a restaurant perched on the mountain. It is owned by Franco and his family. 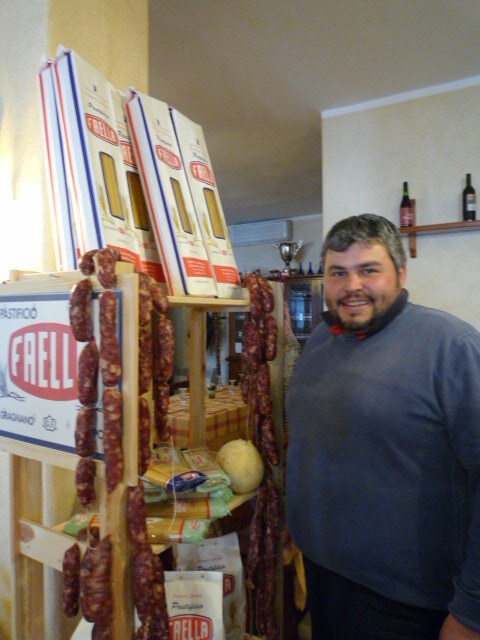 Franco says that he always cooks with Pasta Faella and he is very happy about it. He is so happy, he even sells it to his customers who buy the pasta in cases after having tasted it. Many years ago, it was Franco’s father who suggested they use Pasta Faella. Franco’s father had worked in a Pastificio in Gragnano all his life. Not Faella, another one. When he retired, during the busy season, he happened to go to help the Faellas and was so impressed by the quality of the raw materials, the production, the attention to detail, that he chose pasta Faella for his restaurant. Franco made the MOST AMAZING pasta I ever tasted. 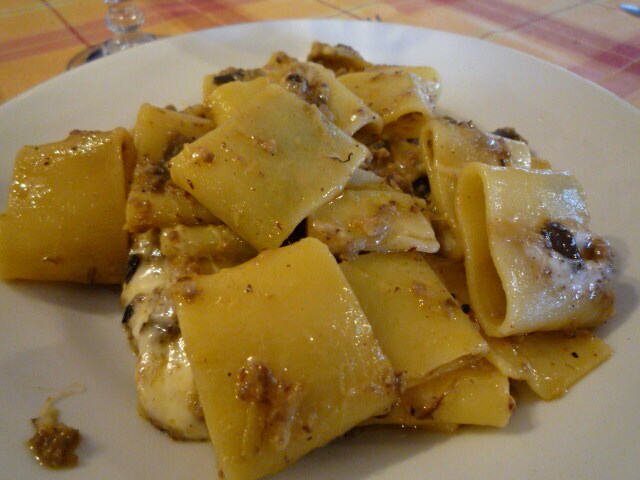 It was the “mezzi paccheri“, a shape I adore, because I think that the whole “paccheri” are too big. He said the name of the recipe was “mezzi paccheri fume’ ” and that the sauce was made with smoked provola (it’s a local cheese), fried eggplants, fresh sausage crumbled and some cherry tomatoes to add color, he said. Now, l’Angolo del Paradiso is a small restaurant in the middle of nowhere. It is extremely rustic and basic. That Franco has chosen Pasta Faella, which is not inexpensive, is a real testament to its quality and the final proof that this is an exceptional product. Grazie, glad to have you with us. Previous Post Why is Faella the Best Artisanal Pasta in Gragnano? I would be really interested in that recipe! As a vegetarian, I would replace the sausage with a vegetarian fake (Field Roast makes the best at the moment in my opinion), and the local cheese (Provola) we would have to replace as well, as we probably won’t get that here in the USA. What good cheese would be similar that we could get? And of course, I am curious about the new pasta. Eventually I will try that as well. Marion, the recipe is above. not much more than what i just wrote. if you replace the sausage and the cheese, it’s still going to be a great dish (as long as you use pasta Faella! ), but it will be a different recipe. call it Norma! by the way, did you try our new organic “sugo Bellini”? it’s made as you like it! fresh tomaotes, fried eggplants and basil. DELICIOUS!! !